The missing plane carrying the Argentine footballer Emiliano Sala has been found and his family has been told, according to head of the private search on Sunday. David Mearns, a marine scientist in charge of the private search for the missing plane, wrote on Twitter Sunday night that "wreckage of the plane carrying Emiliano Sala and piloted by David Ibbotson was located early this morning", which was retweeted by Britain's Air Accidents Investigation Branch (AAIB). "Tonight our sole thoughts are with the families and friends of Emiliano and David," wrote Mearns. The plane transporting Sala, the Premier League side Cardiff City's new recruit from Ligue 1 outfit Nantes, disappeared from radar over the English Channel on January 21. Initial search was halted three days later by the Guernsey police in charge of the operation without finding any trace of the aircraft, the pilot or the passenger. Sala's family raised money to continue a privately operated search later on. With a preliminary examination earlier this week drawing a conclusion that two parts of seat cushions that had been found "likely" came from the disappeared plane, the AAIB decided to commission a specialist survey vessel to carry out an underwater survey of the seabed to try to locate and identify possible aircraft wreckage. After having scored 12 goals in 19 league appearances for Nantes, Sala joined Cardiff City for a club record fee of 15 million pounds. 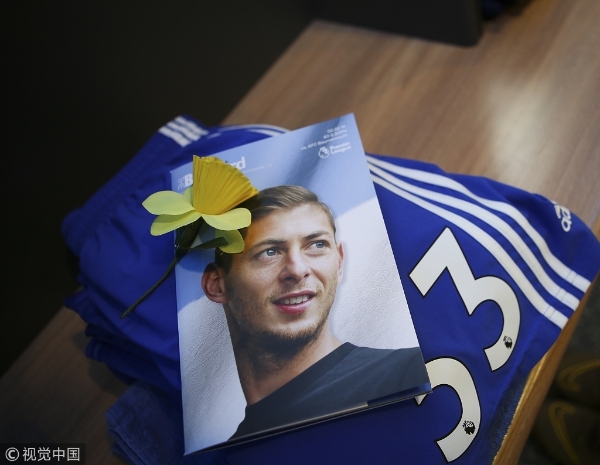 The missing plane carrying the Argentine footballer Emiliano Sala has been found, according to head of the private search on Sunday.